Abnormal movement of the shoulder blade (scapula) is known as scapula dyskinesis. This occurs in a variety of shoulder problems. It is an important sign of an underlying shoulder disorder and a guide to shoulder rehabilitation. In the clinical situation 3 types of scapula dyskinesis can be identified, although there is some overlap between the 3 types. This becomes more evident in the cocking position of overhead sports. It is often associated with tightness at the anterior side of the shoulder (in flexibility of the pectoralis major/ minor muscles) and weakness of the lower trapezius and serratus anterior muscles. Posterior tipping of the scapula is responsible for functional narrowing of the subacromial space during the overhead motion, leading to pain in the abduction/externally rotated position. This is often noticed in the early stages of shoulder disorders. This pattern is winging of the entire medial border of the scapula at rest. It becomes more prominent in the cocking position and after repetitive elevation of the upper extremity. It is caused by fatigue of the scapula stabilising muscles (trapezius and rhomboids). This type of dyskinesis is displayed as a prominence of the superior medial border of the scapula and often associated with impingement and rotator cuff injury. This syndrome is characterised by a drooping of the shoulder and is often seen in overhead athletes. It is thought to contribute to the development of shoulder injuries. In most overhead athletes, abnormal positioning of the scapula can be detected. 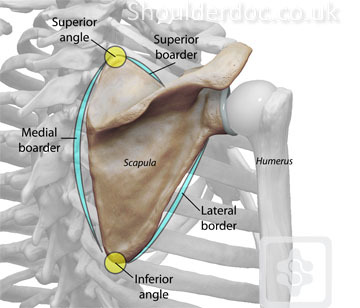 Although it seems that the affected shoulder has a lower position compared with the healthy side, actually there is scapula malposition consisting of forward tilting and protraction. According to Kibler, this clinical picture is associated with anterior coracoid pain, posterosuperior localised pain and pain at the superolateral side of the shoulder (subacromial space and acromioclavicular joint). The anterior localised pain can be confused with other causes of anterior shoulder pain, such as instability or a SLAP lesion. The pain at the posterior side is caused by insertional pain over the scapula and is due to chronic over tension by the abducted and protracted scapula.